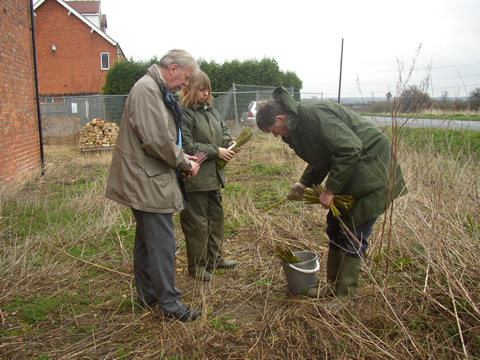 On 29th March 2007 Rodney Cousins planted the first Willow Sets at the Old Willow Works on the south side between the building and the dyke. Some preparation of the ground was required, being quite hard and full of rubble, the cold weather of the day not helping. 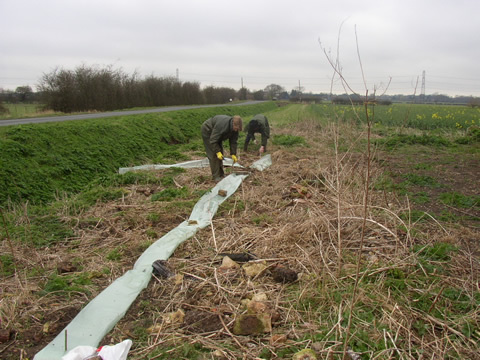 The willows were planted in a line approximately 60cm apart, then protected around the basewith plastic sheeting to prevent weeds and damage by spraying. Several different types of willow were used, kept as far as possible to those native to or used in the area in years gone by, these are listed below. 15 x S Purpurea Daphnoides otherwise known as violet willow. These were once very popular around Beckingham. The stem is a deep crimson colour and the height is approximately 1.5m. 3 x S. alba Basfordiana golden willow, discovered by Wm Scaling c 1870, originating in Basford Notts. 8 x S. viminalis, these are popular basketry willow. Unfortunately not all the Willow Sets survived and it was arranged for Rodney to visit the site in April 2008 to check the plants and replace some. 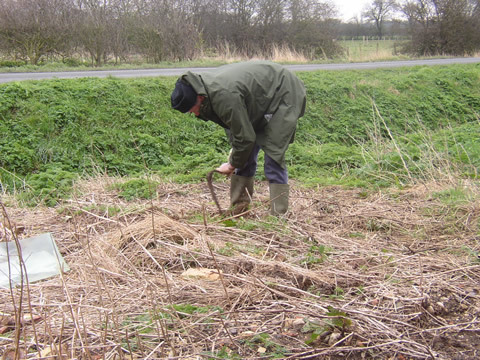 Arriving on a pleasant spring day he set about planting more similar types of willows in the same area, this time placing matting around them in order to suppress the weeds. 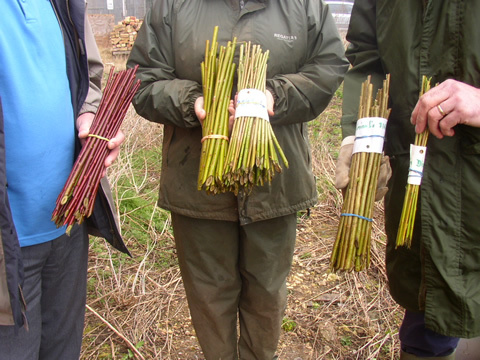 It was hoped they would survive and form the basis of a basketry willow nursery for future planting needs in Beckingham. But yet again, despite all attempts, most of the second lot of willows also failed to take. However, it is planned to try again sometime in the near future.